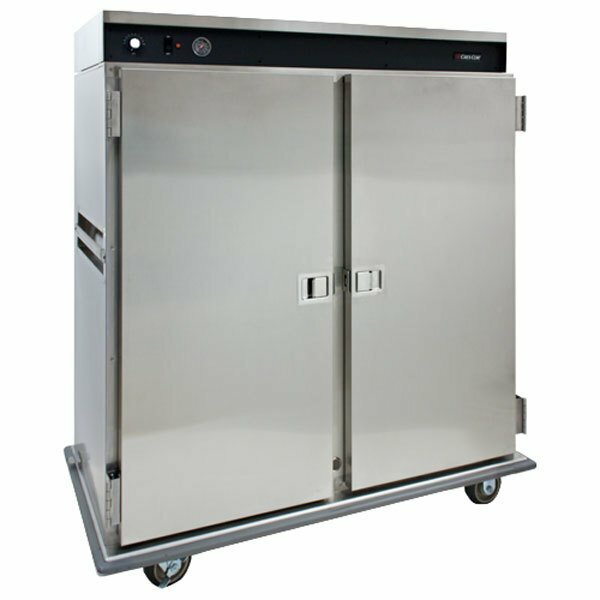 This insulated Cres Cor CCB-120A banquet cabinet provides a heavy-duty way to transport and store hot covered meals at your banquet facility or convention center, or in your restaurant's private dining room! You can keep food hot with the built in heating system, or use accessory Kold Keepers (sold separately) to keep food cold for short periods of time. This models powerful 1650W heating system provides fast response times to quickly reach temperatures of up to 200 degrees Fahrenheit. The self-contained, top mounted power unit also lifts off for easy cleaning and maintenance. The cabinet is made of durable stainless steel for corrosion-resistance and a long product life. It also has a heavy-duty frame for structural strength and rigidity so that it can stand up to heavy use in your banquet hall. To help keep the heat inside the cabinet where it belongs, this model is fully-insulated. This heated banquet cabinet's heavy gauge wire shelves have 16" of clearance between them and can hold up to 120 meals on 11" diameter covered plates. The shelves can also be adjusted on 1 1/2" centers for greater versatility. For easy access to the interior of the cabinet, this model has a double door design. Each of the doors can open up to 270 degrees so the doors are out of the way when you are loading or unloading the cabinet. On the outside of the cabinet, it has a recessed push/pull handle on each side so your staff can move it easily to your serving area. Heavy-duty 6" modulus wheels, two swivel with brakes, allow for smooth mobility even on carpeted surfaces while a perimeter bumper protects the cabinet as well as surrounding doors, furniture, walls, and equipment. A 120V electrical connection is required for operation. This item is certified for the U.S. market to the requirements of the NSF/ANSI 4 standard of the Canadian Standards Association (CSA). The right is reserved to deny shipment for residential usage; if this occurs, you will be notified as soon as possible.